SAN DIEGO — In an ominous start to his season, Tiger Woods walked off the course after 11 holes Thursday at the Farmers Insurance Open because of tightness in his lower back that he attributed to a fog delay. Woods began reaching for his lower back midway through the round on the North Course at Torrey Pines, and his grimace became more pronounced. Billy Horschel picked up the tee for Woods on their 10th hole and took the ball out of the cup for him when Woods made birdie. Woods hit a safe shot to the middle of the par-3 third green. When it was his turn, he had caddie Joe LaCava pick up his ball marker and he waited for Horschel and Rickie Fowler to finish before getting into a cart and driving to his car. In his last six tournaments since returning from back surgery a week before the Masters, Woods has missed the cut three times, withdrawn twice and finished 69th in the British Open, his lowest 72-hole finish in a major. He had said at his unofficial Hero World Challenge in December and last week in the Phoenix Open, where he had a career-high 82, that he was at full strength. He blamed this on having to stand around in the cool Pacific air during a fog delay. Woods warmed up for his 9:20 a.m. tee time and was near the 10th tee when play was suspended because fog rolled in. Fog delayed the start by an hour, and the next round of fog led to a 90-minute stoppage in play. Asked if it was new pain from the back injury that forced him to withdraw at Firestone in August, Woods said his "glutes are shutting off." "Then they don't activate and then, hence, it goes into my lower back," he said, sounding more like a physical therapist than a 14-time major champion. "So I tried to activate my glutes as best I could in between, but they never stayed activated." Woods was 2-over par through 11 holes and in a tie for 130th when he withdrew. He will fall to his worst world ranking since before he won his first PGA Tour event as a 20-year-old in 1996, and he most likely will not qualify for a World Golf Championship for only the second time in his career. Woods is not expected to play again until the Honda Classic in three weeks. Doral is the following week. He did not indicate earlier in the week that he would add tournaments to his schedule ahead of the Masters, which is April 9-12. The front nine at Torrey Pines was more of the same kind of golf he showed in the Phoenix Open last week, when he missed the cut by 12 shots with a short game that was shocking. On his first hole, the par-4 10th, Woods short-sided himself right of the green and he bladed his chip some 35 feet beyond the hole for a bogey. He was in trouble again on the next hole, facing the same chip, and this time struck it perfectly. He chipped in to save par. From there, it was a mixed bag of poor tee shots (he hit only one fairway) and poor iron shots. His tee shot on the par-3 12th wound up on a front tee box at the 13th hole. He missed the green long and right from the 13th fairway. Woods made a 6-foot birdie on the 16th and he made birdie on the par-5 first hole. The last hole he completed was the most telling. Horschel and Woods were in the right rough, about 70 yards short of the green. Horschel hit to about 12 feet on the collar of the green behind the hole. Woods went about a yard from a tee box on the next hole, the shot sailing over the heads of the gallery and down a slope. From there, he duffed his flop shot halfway up the hill, hit the next one too hard about 15 feet past the cup and two-putted for double bogey. It was clear at that point that Woods might walk off, especially with the third green close to the clubhouse. Horschel and Fowler went at the flag. Woods played a conservative shot to the middle of the green, and never putted that one. Woods won five times in 2013 and was PGA Tour player of the year. He has never looked further from the elite in golf as he does now. He returned too early from his back surgery last year, missing the cut in the Quicken Loans National, finishing toward the bottom of the pack at the British Open, withdrawing at Firestone and missing the cut at the PGA Championship. 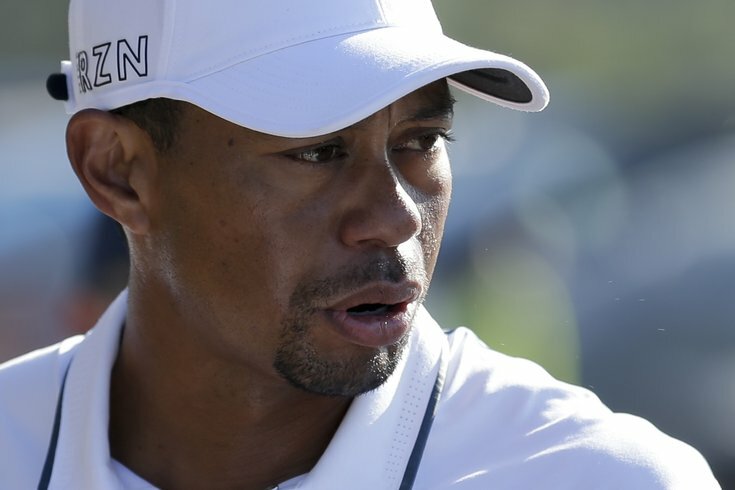 Woods took four months off to let his back fully heal and to regain his strength. He said at Isleworth in December and at Phoenix last week that his health was no longer an issue. But it sent him home early from Torrey Pines, and sent him to a muddied future.